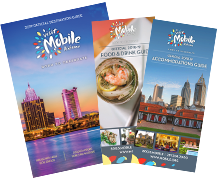 From a relaxing day on the links to an exhilarating night at the races, Mobile has something for every sports fan. Hit a hole in one while taking in the gorgeous scenery at one of our numerous golf courses, or channel your inner Andy Roddick, perfecting your serve at one of the world&apos;s largest public tennis facilities, the Mobile Tennis Center. For those who&apos;d rather observe than play, Mobile has its own minor league baseball team, the Mobile BayBears. College sports enthusiasts can also find something to watch on the campuses of the University of South Alabama, Spring Hill College and the University of Mobile. Plus each January, the Mobile area plays host to some of the best athletes in college football as they compete in two bowl games, the Senior Bowl and The Dollar General Bowl. Looking for the perfect destination for your next sporting event, competition, convention or outing?